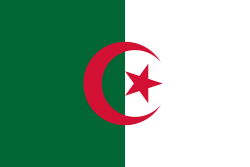 The naitional banner o Algerie (Arabic: علم الجزائر, French: Drapeau de l'Algérie) consists o twa equal vertical bars, green an white, chairged in the centre wi a reid starn an crescent. The white colour represents peace; the green, the brawness o natur; the reid, the bluid o thaim that wis killt while fechtin for unthirldom in the Algerian War (1954 tae 1962) an the starn an crescent represent Islam. The banner wis adoptit on Julie 3, 1962. A seemilar version wis uised bi the Algerian govrenment in exile frae 1958 tae 1962. The banner's design is inspired frae the stanudart o Emir Abdel Kadir in the 19t century whilk consist o twa equal vertical baunds, green an white, as weel as bein inspired frae the banner o the Algerian Regency frae the 16t tae the 19t century, that consistit o a white crescent an starn on a reid backgrund (the same as the modren banner o Turkey; the Algerian Regency wis an autonomous member state o the Ottoman Empire). Housomeivver, for the maist pairt its history is unclear. It is forbye believed tae be based on a banner creatit in 1928 bi Messali Hadj, a naitionalist leader. White, green an reid, alang wi the starn an crescent, haes been uised historically in Islamic kintras. Algerian ships flee the naitional banner as thair ensign, cep for ships o the Algerian Naitional Navy, which uise the naitional banner chairged wi twa reid crossed anchors in the canton as the naval ensign. The Wastren blazon is per pale Vert an Argent; a crescent an starn Gules. a green an white rectangle embossed bi a reid starn an a reid crescent ... the green maun be a composition o equal yellae an blae haein [wi] a wavelength o 5.411 an the position 600 on the normal spectre. The reid maun be pure, o primary indecomposable colour, an exemp o blae an yellae, [wi] a wavelength o 6.562 an the position 285 on the normal spectre. ↑ "The permanent mission of Algeria to the UN". 2005. Retrieved 2008-12-28. Wikimedia Commons haes media relatit tae Flags of Algeria.